Status, presence and elegance. 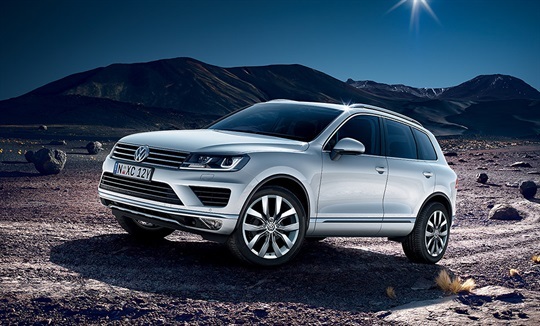 The Touareg is a powerful, vigorous looking vehicle and there are plenty of elegant design touches – chrome integrated tailpipes, roof spoiler, radiator grille with chrome – that hint at the versatility of the vehicle that lies below the surface. Premium class comfort. The unique designed controls are operable with ease and communicate discreet elegance owing to the chrome highlights, and luxurious design trims that visually enhance the SUV. The front seats feature 14-way electric adjustment including electro-pneumatic side bolsters, with leather appointed seat upholstery‡ for the best possible comfort. Clearly connected. The now standard Satellite Navigation (RNS80) audio system together with the 8" touch screen, DVD drive, dual SD card slot, Bluetooth phone connectivity and premium multifunction display provide outstanding infotainment with intuitive controls and navigation. Delivering the drive you want. The Touareg is one of our most advanced models yet, with a range of clever driving technologies from the superior handling of the 4MOTION All-wheel drive system to Rear View Camera (RVC Plus)*, and Driver Fatigue Detection System* providing the safest drive possible without intruding on the driving experience itself. V6 TDI interior with optional Driver Assistance Package and Technology Package shown. Taking on a new design, the high quality Bi-Xenon headlights with integrated LED daytime driving lights are now standard accross the range, offering better illumination, increased durability and using less power than Halogen technology. Also includes redesigned front fog lamps. The sophisticated new wheel spoke designs include the new 18-inch Arica alloy wheel design for the 150TDI or the 20-inch Masafi alloy wheels for the V6 TDI. Even more impressive is the large 21-inch Mallory alloy wheels, featured on the V8 TDI R-Line. 14-way electically adjustable front seats are a standard feature across the range. 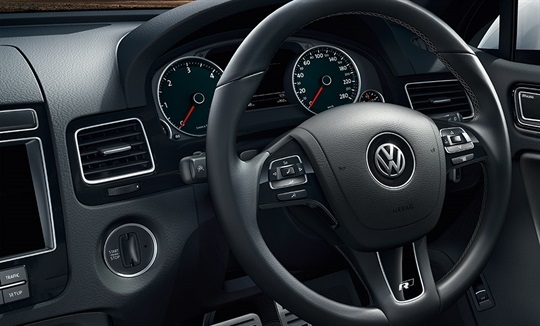 The 150 TDI features the Vienna leather appointed seat upholstery, while the V6 TDI and the V8 TDI R-Line come with luxurious, smooth Nappa leather appointed seat upholstery with heated front seats. 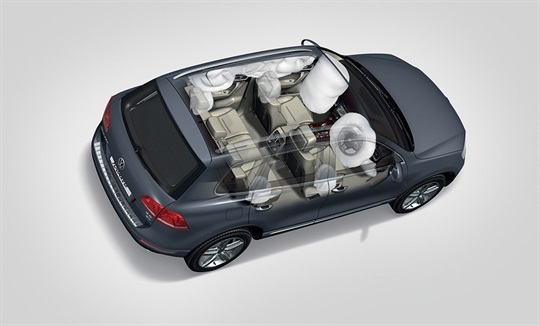 The Touareg has a generously proportioned interior and a high seating position, which makes it easy to get in and out. The Rear View Camera (RVC Plus) parking distance control is a video-based parking aid, standard across the range. The system is activated by engaging reverse. Rear View superimposes guidelines on to the image on the screen to assist the driver to estimate distances and position, while the front and rear parking sensors provide acoustic warning and audio volume level reduction when sensor warning is activated. Satellite navigation RNS850 is now standard across the model range. Calculating your travel route with incredible speed, a user friendly 8" touch screen and premium high-resolution touch screen display showing maps and video, this unique system makes getting anywhere easy. With a generous 60GB hard drive for storing music and navigation data and a built-in MP3 compatible DVD drive and SD card slot, great music and the perfect movie (when stationary) is always at your fingertips. This state-of-the-art system applies the brakes to prevent or mitigate a secondary impact during a collision. If an initial collision has been detected by the airbag sensors, the vehicle is automatically slowed so that a secondary impact will be lessended or avoided. During braking, the hazard lights and brake lights are illuminated and remain activated even after braking has ceased. Smart technology when you need it most.